My Story: Tackling the Stigma of Low Back Pain- Pain News - Pain.dieutridau.com - All for Pain Relief ! As a registered nurse who had overcome several injuries and fractured bones, I arrogantly believed I knew everything about pain and assumed my back pain would be a quick fix. I was dead wrong! I began seeing another specialist, and underwent more injections as well as physical therapy. I was eventually prescribed pain medication, despite my wishes to manage my pain without it. The pain meds offered some relief, but not enough – sleeping, sitting and driving became nearly impossible. That led to my cycle of torment and mental anguish, and the realization I was maxed out on pain pills, patches and injections while increasing my debt without any relief or hope. The medications were expensive and masking, but not treating, my pain. The “stigma” associated with chronic pain began to consume my life. Throughout that time, I faced the stigma of chronic pain. Before I would do anything, I would count the number of pain pills I had and think, “Do I have enough to cope with the pain? What if I run out early?” My doctor and pharmacist began suggesting I was a drug seeker. Even my ex-wife began to believe them. For three years, I was tormented with the anxiety of calling for a refill, fearing I would confirm what they already thought. My relationships with my ex-wife and children became strained. I isolated myself from my friends and refused to do any physical activities. Eventually my doctor agreed to do another MRI, this time with contrast material, which helps make certain tissues or abnormalities more visible. The MRI revealed bulging discs and annular tears in multiple areas and my doctor told me I would need drastic surgery. While others in my immediate family have had back surgery, I wanted another opinion. I finally sought the advice of a neurosurgeon, who reviewed my recent MRI and confirmed I did in fact have bulging discs and annular tears, which were relatively common among active men my age. 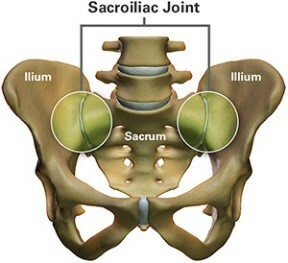 But he suspected there was something else contributing to my back pain – my sacroiliac (SI) joint. He conducted a simple test to confirm the diagnosis, and I learned I could qualify for a new surgery that stabilizes and fuses the SI joint. For the first time in years, I felt hopeful. I was enrolled in a clinical trial and was treated not like a hypochondriac or drug user, but like someone suffering from real pain. In order to have good comparison data for the study, patients were randomly assigned into one of two groups: one that got surgery right away, the other that had to wait six months and continue non-surgical treatment. Unfortunately, I had to wait the six months. When the doctor told me I had to wait, I broke down and cried. I was overwhelmed with the thought of enduring six more months of chronic pain and facing the stigma from the pharmacy. 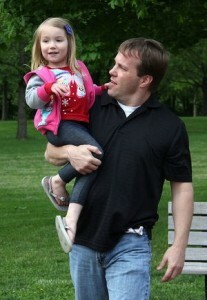 Kyle McCord, shown with his youngest daughter, Brynn, after he had his surgery. The six month wait could not end soon enough. I finally had the surgery on September 17, 2014, and I told myself, my family and my doctor I wanted to be off of pain meds within three months. My doctors expected my recovery would be longer and that I would be on pain meds for another six to nine months. But I was determined to end that part of my journey and wanted to control my own life. Three weeks after my surgery, I was pain free and back at work without any restrictions. I can’t say SI joint fusion is the answer for everyone, nor does it bring the same results for everyone, but I am proud to say I have been pain free for eleven months. I am now an even stronger advocate for my patients and strangers alike who are in a similar position searching for answers. My advice is to never take no for an answer, and never let someone label you something you’re not.